Essentially Flyertalk / Re: goEMAW.com bbq, smoking, grilling, etc. thread! I grew up on a cattle ranch with essentially unlimited free beef and we had steak like 4 times a week. I can relate. (Except the not liking steak part) I grew up on steak, hamburgers, and fried chicken. Dairy farm as well as beef cattle. Still get all my meat from the farm. I'm the only one in my family that requests the skirt steak so I've got a freezer full of that for stir fry. 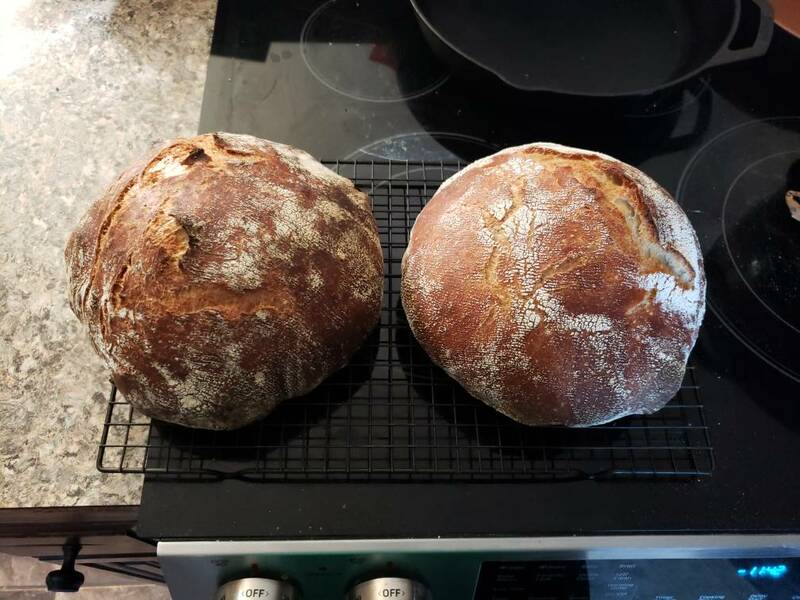 Started baking bread. Made 4 loaves this weekend. hE, that is some amazing looking bread. Some might even call it artisanal. Give us some deets on the recipe please! I can give the recipe, but it's prob more the technique. I asked for basically one thing for xmas. 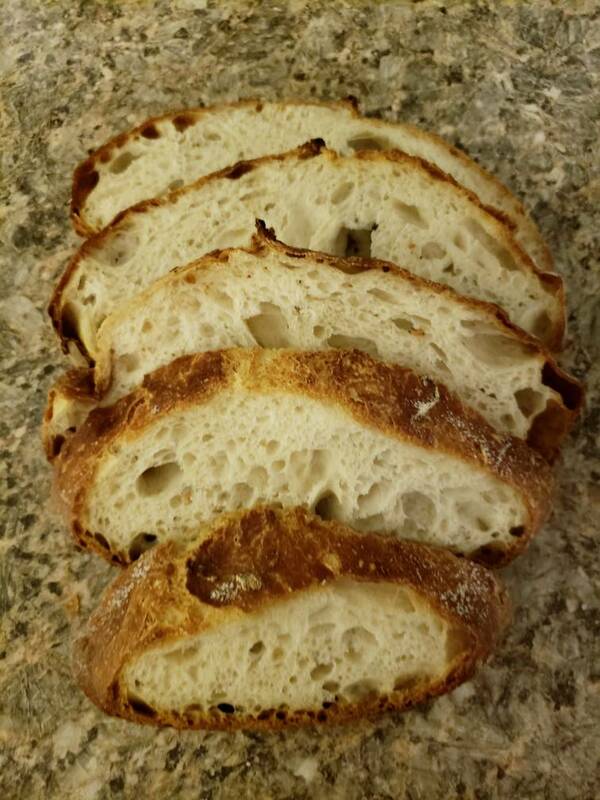 The book, "Flour, Water, Salt, Yeast" it kinda details the process of making bread at home. I'd recommend it and the one the same author wrote about pizza dough. It's my first go at it. Will likely take a few times to get it exactly right for my oven. It's good. But the kids don't approve. They don't like the crispy exterior. Going to try and make some loaves with a soft crust and see if they'll eat that. Screw that. That crunchy crust is where it's at. Toughen those kids up, along with the roofs of their mouths. Agreed. I cut off the caps with the most crunch and eat with some butter or olive oil. Frozen, but that's the inside. I sliced them up and froze them. When we need some we just pull out the slices we need. I use mine for stews, chili, beans, rice, tomato sauce. I use the same recipes that SD linked above for pasta sauce (although if I have time, I will still do the long oven cook from time to time.) Recently made 3 liters of chicken stock in about an hour from smoked chicken carcasses. We can be critical of the phrasing of our fellow poster. However our whiteness is noticed by others in p5 ranks. Seriously guys. I'm not gEing here. My P5 staff buddy constantly criticizes KSU recruiting staff as too white. Will always be hindered because of it. No, he's not white. I definitely criticized Bill for never having a black coordinator before Coleman this season. IMO all CFB staffs are too white, I honestly didn't realize KSU was significantly whiter but am not surprised. He was an early favorite to stay per my friend. Not so sure now. We were never too white, well not any whiter than anyone else. We had 4 black assistant coaches on Snyder's last staff, there aren't too many P5 schools with more. Also is your friend confusing Coleman with Norwood? I don't believe Coleman has done any recruiting since Bill left, Norwood has. Tell your P5 friend to focus more on his staff, he's got us mumped up. The conversation about minority assistants needs to be divorced from recruiting talk. It's offensive that we, or any other staff, need black coaches to help with recruiting. As if black people can only relate to and be comfortable with other black people. The best recruiter in America is Nick Saban and it's not because he comes in and slams down a bunch of rings, he doesn't do that. The stories of him making connections with the kids and their families is awesome. Find his electric slide video. Are water bills all the same within a water bill collecting area and other fees like specials take care of maintenance/new construction? It depends on local regulations. Some communities are pretty even across the board. Others may charge industrial/commercial different rates due to increased usage (larger pipes, more outflow, etc..). Others may have different districts that get credits based on where their water goes, age of pipes, etc.. Others provide service to rural customers and they generally get charged a higher rate than people within the service area. Even other areas will be levied under special taxes for the particular area, where the citizens of a neighborhood pay extra fees/taxes to pay for new pipes over a 10-15 year period. <- these generally happen in new development areas. Water itself, on average, costs like a tenth of a cent a gallon, so it is dirt cheap regardless of where you live. Wastewater, for many communities, is calculated when your water usage would generally be at its lowest (winter months). The water utility will average out the amount of water usage from like November through February, and then calculate your monthly sewer charges for the next year off of that. So months where a lot of the water usage doesn't end up in the Sanitation sewer (yard watering, pool filling, etc..), isn't taken into account. If you want to shave a few dollars of your bill, limit water usage as much as you can during the winter. Storm Sewers are a different animal and every community does them differently. In general, most communities use some formula based on the amount of impervious area on your property that would lead to stormwater runoff. The formula generally includes what the landuse of the property is as well. Most communities don't try to calculate the amount of impervious area on a single family property, so a lot of times, all those properties will just get charged the same fee, regardless of size. Some put that as a monthly charge in your water bill, others just tack on that amount in your end of year property taxes. etc... This is why you'll often find retention ponds on or near areas with lots of pavement as a company like walmart can get a huge discount on their stormwater fee if they route the water to their own storage pond. You didn't ask for all that, so sorry for the extra info. 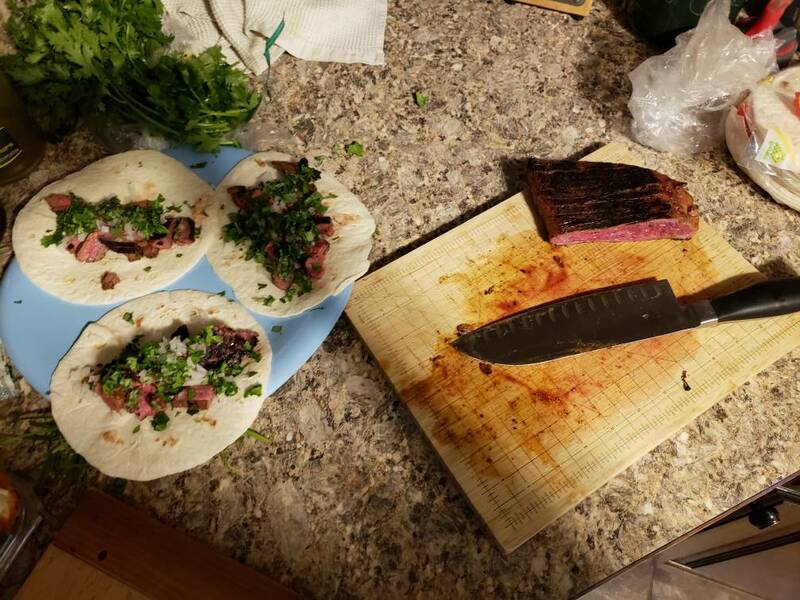 Made some carne asada tacos. No homemade tortillas though. Really want to try though. Do you dudes hand grate your cheese or bag it? Nah, the crust is airy and crispy, cheese is gooey and stringy. At 500, 2-4 minutes it woulda been black. A minute is about all the more time it could take. Unless you like black, then yeah. I freeze the cheese after shredding, so it doesn't burn before the crust hits the right level. Even then, 8 mins is about max. Without freezing the cheese, 5-6 mins and it is toast. That's very impressive halfEmpty. Was it as tasty as it looks? 8/10. I didn't have any more homemade sauce. Also wish the wife would've got natural cased pepperoni. I love the natural casings cuz they curl up and you get those tasty burnt edges. Still good though. What do you guys cook in this thing? We have rice all the time, but we use those 90 second bags and they seem fine to me, and easy. And pasta in plane pot with boiling water is simple enough. I don’t get this instapot thing? pressure cookers are good for cooking things that take a long time in a very short amount of time. I use mine mainly for stews, pot roast, chili, brown rice, stock, and marinara. Marinara is the only one on the list that isn't better than the traditional method, but it is close. If I have the time I'll still do a 6 hour reduction for marinara, but the instapot comes dang close to the same result in an hour. Kansas State Football / Re: How calm are your waters? Overall I agree. It should never have gotten to crunch time. But he did come through in crunch time. He overthrew an open receiver on third down and his wide receiver bailed him out. The TD to zuber was where it had to be. Any lower and it is batted down/intercepted. It was thrown over a wall of defenders.